Already waiting for you in the beer aisle are two very good summertime brews. The first, Sierra Nevada “Summerfest”, is a Pilsner-style lager. Gold-yellow in color, it tickles your nose with lemon, spicy hops and a hint of fresh-cut hay. On the palate it’s crisp, and you get lightly sweet malt, with the hops kicking in at the finish. Somewhat darker in color and fuller in body is Deschutes “Twilight”, but it’s still lighter in both color and character than most pale ales. Like the “Summerfest” it’s got citrus and herbal elements in the nose, but more orange than lemon and more grass than hay (and maybe a little pine in there too). On the palate, the hops are more forward than with the Sierra Nevada, and the malt is similarly sweet with just a hint of toast. The two brewers have taken different paths to achieve the goal of producing a light, refreshing beer for warm summer days, with the Sierra Nevada being a lager (bottom fermented) and the Deschutes being an ale (top fermented). Which is better is a subjective matter (checking www.beeradvocate.com I see that they get almost identical scores, 3.69 for the Twilight and 3.64 for the Summerfest). 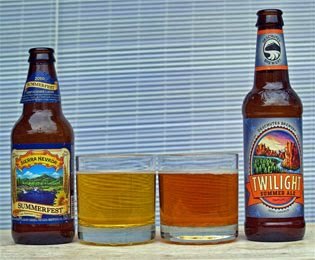 If you want to keep your dollars in Oregon, go for the Twilight, but speaking for myself I think I favor the Sierra Nevada, which, with its snappy aromas and crisp character, seems the more refreshing beer.